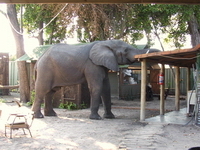  Monthly update from Selinda & Zibalianja Camps in Botswana.  Monthly update from Jacana Plains in Botswana.  Rare sighting of Cattle Egrets at Little Kulala. What a phenomenal month for wildlife this has been! With wildlife sightings ranging from big breeding herds of elephant with two babies of only a few days old, to the once in a lifetime sighting of a leopard taking a kill away from an African Rock Python, but more about that later. The weather this month has been absolutely outstanding with days cooling off a little to an average midday temperature of 30°C, and mornings are a nice and fresh 18 - 20°C. The winter is definitely on its way though. And so are the floods, creeping up on us every night ever so slightly. The camp is now just about surrounded by the floodwater, and all the guides and guests are commenting on the fun they have driving in the water. Boating channels were opened on the 26th of March, and this activity will start in April with full steam. We are looking forward to it. Birding has improved (if it is possible to improve on the already excellent birding we have done in the last couple of months!) and some of the migratory species are in full swing getting ready for their long migration to warmer climates. Now, about that incredible leopard sighting. It has been our privilege to be part of a once in a lifetime sighting of a young female leopard taking a young impala lamb away from a rather large African Rock Python. The python was unfortunately killed in the process though, but that is Africa for you. While the python was in the throes of the kill, a young female leopard heard the commotion and came over to investigate, walking around and around the python until she located the head. Then, in a blur of motion, she grabbed the python by the head and killed it. Very proud of herself she casually grabbed the impala and ran off with it still kicking. After killing it, her brother, slightly bigger and heavier, although of the same age, came over and took the impala from her, then started to feed on it. A while later the leopard mother came out of the bush and tried to get a bite, but he snarled at her and she stayed away. Three leopards and two kills in one afternoon. All credit for this once in a lifetime sighting has to go to Victor (our Head Guide) and the python, who paid dearly for this, but gave our guests this wonderful opportunity. Other sightings ranged from elephant to buffalo and all the plains game species in their numbers, as well as the king of the jungle, Mr. Lion himself. We are looking forward to the next month with the floods now coming in on schedule, with a very high flood level expected. March was a month with a difference, floods were one month early and as the statistics have shown we are receiving more water - this is already up by 56cm on last year and we are expecting more. The Delta is an amazing place as it is, but with this flow of water seeping in, it makes it the biggest natural oasis in the world. Rain this month has been better, with 53mm received and with some huge build-ups of clouds - but unfortunately with no results. This was an extremely hot month with days soaring to 42°C many times! Winter is nowhere in sight as of yet and we still have no cold days to report. Wildlife has moved around the concession following the new water, which promotes new life with grass shoots and foliage on the trees for the elephants amongst others. Elephants by the dozen are around camp and sleep close to the guest rooms, providing an amazing night's experience for all. We are on occasion sharing the island again with lions, caused by the influx of water as they cross over moving north. They have showed us their speed and power with numerous kills on the lechwe and zebra, close to the deck during and after tea time. With nights and days of hearing the sounds and seeing tracks around the camp, the elusive leopard has finally been seen - with some amazing sightings during the night. The migratory birds are on the move again, leaving for warmer climates. A few are still left behind waiting till the last moment; we have been spoilt with two separate sightings of Flamingos in the Jao floodplain. It has been a quieter month, due to the hot weather and it not yet being school holidays in other parts of the world. Those that did brave it will be enriched with the memories of the Okavango Delta for the rest of their lives. Tea time has been a wonderful activity this month, thanks to the lions and the wonderful guests we have met during their stay here with us. We look forward to seeing you and our staff look forward to having tea with you too. For those romantics and Honey-mooners who spent time here with us and let us spoil you with special Champaign breakfasts on the upper deck - thank you! 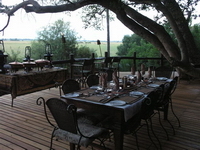 To end off a day with a perfect evening's dinner under the stars is always a treat and memorable occasion. 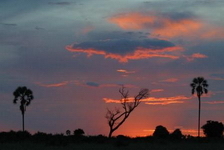 MAY THE ADVENTURE OF AFRICA TEMPT YOU TO BOTSWANA! March has been a wonderful month, weather-wise receiving only some scattered showers around the beginning and the end of the month with a lot of sunny days in between. We received 65mm of rain this month with 44mm in a huge storm in the first week of the month. We have not seen a real huge push with the floods this month as the water came in very fast and high in February and then it leveled out towards March; we might see a second push coming through during April, but we will have to wait and see. Our resident pride of lion have taken another "knock" this month as they lost yet another cub - the young male. 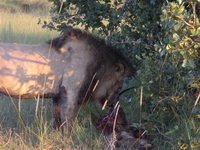 He was injured by "Freddy", one of the pride males while feasting at a kill when his left front leg was badly broken and he finally died of starvation as he could not keep up with the rest of the pride. The only cub left is a young female who we hope will make it but as we can see life out here is very harsh! A little good news is that our resident female leopard which has been missing for a number of days seems to have had good reason for this as the guides believe that she has given birth. They said that the second last sighting of "Beauty" was when she seemed heavily pregnant and the last sighting was a big saggy stomach with her teats hanging and it appears she is lactating. 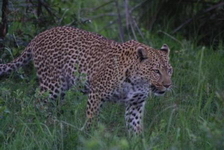 WOW - it will be wonderful to have a young leopard in the area again. We will possibly only see the cub or cubs after two months or so as she will keep them in hiding until then. With the little rain and the Marula trees dropping their juicy ripe fruit we had a healthy number of elephants in and around the camp. This is always a good sighting with guests and one can never get tired of seeing these huge pachyderms from a closer vantage point. We had a couple of resident bulls in camp daily and one old bull that sleeps flat on his side behind our office and seems not even to notice the goings on of the camp in the mornings as he is sleeping late. He has no worries, and this is a good indication that the elephants around here do not have many natural enemies to worry about! Red lechwe, red lechwe, red lechwe, this is all you see for miles as you drive down the Jao floodplain where the vehicle is in at least three feet of water. This is a once in a lifetime experience as the red lechwe in the numbers we are seeing do not occur everywhere but only in selected areas in the northern areas of the Okavango Delta and parts of Zambia - particularly on the Kafue Flats! During the inundated winter months they are the main food source for the lions in our concession as the other larger mammals tend to move to higher ground further away from the water. A great sighting for NG25 this month has been with our head guide Victor Horatius as he spotted an African Rock Python with a young impala in his grip trying to squeeze the life out of it. Just as the python had it in a proper grip Victor saw a leopard approaching through the grass and knew that this was going to turn into a great sighting. The leopard came out of the bush smelled and checked and was presumably looking for the head of the snake because as soon as it found it, it went down with force and grabbed the python by the head and crushed it with one forceful bite. The leopard dragged the impala from the dead python only to realise it was not dead yet and biting harder into the neck until it was dead. This whole scene played off in about an hour and a half and the guests and guides were just ecstatic. We had a busy month with some fantastic guests and I include some of the feedback below. This is all from the Jao team, until next month! Happy dreams of Africa! The weather this month kept on changing, especially the first three weeks of the month - when it hit the third week of March it started raining in the afternoon and it just kept on getting stronger and stronger until towards the end of the month where it rained continuously for four days! The first two weeks of the month temperatures were between 25º minimum and 38º maximum Celsius, while during the course of the last two weeks of the month, due to more build-up of cloud the third week got more humid and a bit hotter until it started raining - that's when temperatures dropped to about 17º minimum and 22º maximum Celsius. It was an awesome month due to the temperature change, which had a lot of influence on animals and their movement especially the elephants, in the second week of March we had fantastic sightings of elephants coming to the lagoon in front of camp. It was the same week that we saw 300 to 400 elephants every day coming to drink. While on the other hand there have been lots of other species that we have seen at the lagoon, such as sable, giraffe and lion. All this great viewing was mainly in and around the camp. But the game drives have been having outstanding experiences too, whereby on every second drive guests would have seen lion, leopard, cheetah and we had three great sightings of wild dogs in this month. With two of these dog sightings, the guides followed them hunting and after a few attempts were made, they were rewarded at the end by seeing the dogs killing an impala and a sub-adult female kudu on two different days. Again it was one of those sightings that guests could not stop talking about as to how amazing and fortunate they felt to see a kill of this nature. There have been large herds of buffalo moving around Jackie's Pan, Vumbura plains and the northern sector. We have also had awesome sightings of hyaenas at their den on the road to the airstrip. In the evening, while we have been sitting patiently at the den site, the pups have been coming out of the den and approaching the vehicle. 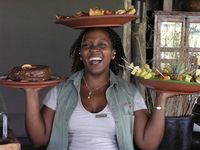 The past month has been a great month to offer guests a variety of activities, from doing the mokoro in the morning (with this being the best time of the day as it gets a bit too hot in the afternoon), to being able to do walks, with the vegetation not been as thick - not forgetting the "usual" activities of game drives and boat. It has been a fantastic month indeed for all guest experiences. Greetings from our paradise island! March has been an interesting month at Jacana. The floods have continued to come in and the water levels can be seen rising on a daily basis. Jacana is now a truly water-based camp, as the only way into camp is by boat. Game drives are still possible after a short trip by boat to the main land, and the trip is worth it. Sightings have been great the past month, with highlights including lions on a zebra kill, leopard, elephant, hippo and buffalo. The rare sitatunga, an antelope adapted to the aquatic habitat, was also spotted from the boat on the way back to camp. Our resident bull elephant, Jack, has also been visiting the island on a regular basis. He has been attracted to the Marula tree, which is in fruit at the moment. Contrary to popular belief, an elephant cannot become drunk by eating large amounts of the fermenting fruit! Birding has also been exceptionally good. Over a 145 bird species were identified within 48 hours by a keen pair of bird lovers staying at Jacana. Amongst the highlights of bird sightings at Jacana, they included Wattled Cranes, Saddle-billed Storks, Lesser Jacana, Purple Heron, Open-billed Storks and Western Banded Snake Eagle. The Pel's Fishing Owl had been elusive, with their haunting calls being heard a number of times, until two were spotted on a mokoro trip on the last day of the month, not far from camp. 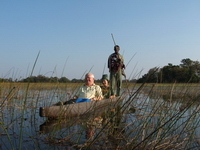 There is still no better way of experiencing the Okavango Delta than by the traditional way of transport, the mokoro. Silently making your way amongst the islands, finding the smaller gems of the Delta, such as the tiny Painted Reed Frogs, which would have been missed otherwise, it is a truly unforgettable experience. It is therefore a very popular activity at Jacana. The end of the month saw some good rains, with over 60mm being recorded in the last week. Some of the rain came in the form of spectacular lightning storms. It brought some relief from the heat experienced during the rest of the month, and also accelerated the rise of the water levels. We are looking forward to another adventure-filled month, wish you were here! After the rains at the end of February, all the pans on the concession filled with water and the bush came alive. The evenings echoed with the plopping sound of the Bubbling Kassinas and the soft trill of the Banded-rubber Frogs. It seems as though things are happening a little later this year and the following occurrences have confirmed this. During March we saw a few Baobab trees flowering - these generally flower between October and November. We also had our first sighting of Senegal Lapwing (Plover) this month. Last year we were seeing them regularly from January onwards. The Armoured Ground Crickets also started to emerge this month compared to last year when we were seeing large numbers of them by January. These annual variations are extremely interesting to note and we will continue to monitor them to see if any trends develop. The diversity of Pafuri always seems to turn up special sightings in special places. One of the highlights of the month was a herd of close to 30 eland that settled in the region close to Crooks' Corner. We were fortunate to have numerous sightings of this herd during the month. A treat indeed, but to top it off, most of these sightings were in a forest of Fever Trees. A herd of 18 eland, which included four calves, were also seen on a few occasions in the open plains of Makwadzi Pan set against the backdrop of a grove of Lala Palms. 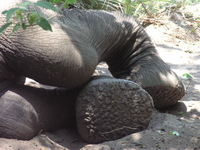 There were also a number of herds of elephant seen on the Luvuvhu River floodplain during the month. One of the sightings of these herds was extremely special as while we were watching about 60 elephants make their way across an open area to the Luvuvhu River, there were three lions resting in the shade of an Umbrella Thorn. Even if the lions or elephants had not been there, we would still have been graced with the scene of the setting sun bronzing the hundred-metre-high sandstone cliffs of Hutwini Mountain. 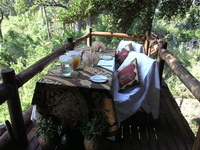 To have it all at the same time was something which truly typifies the beauty of Pafuri. As far as the general game viewing goes, the good viewing that we had during February continued into March. Notable sightings were a bachelor herd of nine adult kudu bulls. As usual, there were almost daily sightings of the buffalo herds which roam the concession. On one morning game drive, five separate herds were seen. On the predator front, we had regular sightings of lions during the month. It is great to see that the six sub-adults are still going strong. Five of them are males and we are all anxious to see the formidable coalition that they are likely to form in the area in years to come. The month also produced an increase in the number of spotted hyaena sightings and this could explain the fact that we saw the remains of a zebra carcass that had been hoisted up a White Seringa tree by a male leopard. There have not been many records of leopards hoisting their kills in the area over the last 20 months, but we expect this behaviour to increase as the hyaena population continues to grow. From a birding point of view, the month got off to a good start on 1 March with a sighting of four Racket-tailed Rollers close to one of the nest sites that we found in December. The Monotonous Larks were also very vocal following the rains and their repetitive 'syrup-is-sweet' call echoed across the plains in the early mornings. The majority of the migrants remained throughout the month and it was exciting to hear the insect-like call of a River Warbler in camp on numerous occasions. There were also regular sightings of a pair of African Crowned Eagles close to camp and on one occasion we were fortunate enough to see one feeding on a Yellow-spotted Rock Hyrax. We continued to have good sightings of the regular specials throughout the month. Worth mentioning though are the sighting of 7 Three-banded Coursers by a guide on a single evening drive and a pair of Pel's Fishing Owls who were regularly heard calling in front of Room 15 at night. Other interesting bird sightings during the month included Pink-throated Twinspot, Senegal Coucal and a pair of Gorgeous Bush-Shrikes mating. So it's that time of year again when we bid our turtles a farewell. Until October that is. It has been a phenomenal season that has seen a staggering 104 Turtle adoptions and a definite increase in nesting Loggerhead Turtles. Leatherback Turtles have remained elusive but between this season and recent years we have seen enough of them to discern that their population is stable. In summary, during the last five summer months we have had a total of 403 Loggerhead and Leatherback Turtle sightings and a total of 577 turtle tracks which indicates the total number of nesting emergences onto our beaches. Of these, we were able to tag 79 turtles with titanium tags and inserted a further 33 microchips embedded under the skin of the turtles to enable identification even once tags have been lost over time. The weather in March was not always too favourable for the hatchlings of both species with massive banks being scoured out of the normally gentle beaches by explosive waves at times eight metres high. Having said that and given that we are likely to have lost a number of eggs in the adverse conditions, we did witness many hatchlings gallantly making their way down to the unknown that is the vast Indian Ocean and beyond. We started the season way back in mid-October 2006 with a sighting of a nesting Loggerhead Turtle on the very first night and we were thrilled to end the season in the middle of March with a sighting of Loggerhead hatchlings on the very last drive. These were about to begin their long journey to the safety of the Agulhas Current. No adult turtles of either species were recorded nesting during March, perhaps as a result of the very rough seas due to very low pressure cells approaching from the Durban region. So in the five months we managed 151 turtle drives equating to 9060km and 450 hours of beach driving in our nocturnal searches of Maputaland's coastline. We enjoyed the company of roughly 1 500 guests driving with us anxious to see one of these majestic mothers or brave hatchlings. The researchers, although they cannot say for sure how many miles they have run up and down the beach, are all feeling like they have run a few marathons and are recouping in hopes of an even better season come October 15th 2007. Rob and Lia adopted Ninja the Leatherback Turtle. Her tag number was KK206. Jon and Belinda adopted two Turtles, one called Michael the Loggerhead and the other Lindsay the Leatherback Turtle. Rex and Stephanie adopted Sapphire the Loggerhead Turtle. Mateo and Donatella adopted Pralina the Loggerhead Turtle. So until next season we bid everyone farewell and extend a warm thank you to all who participated in this season's Research project and even greater thanks to all those who have adopted a Turtle this season and all the seasons past. The weather is a powerful force and this month we experienced a very remarkable part of it. The month started off with the cyclone off Madagascar. These don't usually affect our weather unless they start heading south towards us - which was the case this time. Mozambique was affected by heavy rain and flooding. We missed the rain, which we needed badly but got the rough seas, which weren't really needed. This all happened in the first week of the month. From the fourth onwards we managed to dive again although the large swells still kicked up a lot of sand over the reef. Dives enjoyed watching the Kingfish and Potato Bass use the billowing sand as cover to ambush fish. We heaved a sigh of relief thinking that was the end of the rough seas, only to be hit at the end of the month with an equinox tide and 4m swells. The effect on the coastline was immense, with whole sand dunes eroded away, wave action cutting into the bush leaving trees littering the beach. Our first dive after the rough seas was a bit milky with a lot of forest debris down below. We expected the worst but the reefs weren't too badly damaged, although some of the big plate corals had been broken off. There were big shoals of fish on this dive and afterwards Eric and Annemie got to see their first Whaleshark - in fact, not just one, they got to snorkel with two Whalesharks! One of these had a pod of Dolphins swimming alongside. They played around the Whaleshark and all involved swam slowly enough for us to snorkel alongside and watch. We had many other opportunities to snorkel with Dolphins and Whalesharks this month. There were five individual Whaleshark sightings, sizes ranging from 4 to 8 metres, none of which had been tagged or seemed to be swimming in any particular direction. Kingfish and Potato Bass have been feasting in the turmoil on the reefs. The large group of Potato Bass on Pineapple Reef has been particularly inquisitive, swimming right up to us to examine us or for a nice scratch. Kingfish still follow us around on the reef and we have even seen Golden Kingfish around. Some of the Golden Kingfish swam around in pairs, while others were seen swimming with Casper, the big Potato Bass on Pineapple Reef. Fishlife has been teeming: Fish chasing each other around, investigating what we are, pretending to ignore us, or simply hanging around in one spot. We have seen a Prodigal Son and Ignoblis (Giant Kingfish) swim by at Pineapple Reef, as well as a shoal of 8 Couta. Elusive Reef has also provided us with Couta sightings and big shoals of Green Jobfish on more than one occasion. In this month's extensive fishlife sightings, we have seen many different sizes of Scorpionfish, Paperfish, Lionfish, Angelfish, Octopus, Stingrays and Eels. There have been Sharpnose, Round Ribbontail and Honeycomb Stingrays, providing a brilliant display to divers as they swim off into the distance. On a dive at Gogo's a Marbled Electric Ray swam up between the divers and then off to find a ledge to hide under. Geometric Eels have been seen lying close together in groups of three under one coral. The same behaviour occurred with Black Cheek Moray Eels; they were seen in groups of three or four. We are not too sure if this is mating behaviour, as they are normally solitary. Before the rough seas we had a healthy population of big Slinger Seabream on Pineapple numbering about 40 fish. These were adult fish weighing in at about 2kg. This species is an important linefish in KwaZulu-Natal waters and they have been heavily fished in most areas. It is seldom that you will see the size and quantity of fish that we see at Pineapple, in other areas. This is because the reef fish in our area are protected and fishermen and spearfishermen are only allowed to target the pelagic fish, such as King Mackerel, Kingfish etc. After the rough seas the number and size range of Slingers increased considerably and spread across more of our reefs. We encountered populations that seemed to be far more than a hundred on Elusive, Gogo's and Pineapple. On some of the dives the Slingers would appear out of nowhere and start circling around us. It gave the impression of being caught at the centre of a whirlpool. Some of them seemed to have never seen divers before. They swam right up to us and darted off again and followed us for some time as we continued on our dive. Mandla picked up almost 20 Slingers that had washed out on the beach. We think the Slingers may have been migrating, since the numbers did start to decrease considerably towards the end of the month. Another special encounter on Gogo's has been with a Bowmouth Guitarfish, which is rarely seen by divers. The Giant Guitarfish is much more common and is the one generally seen. The Bowmouth has ridges running the length of its body which have lines of spines about 1cm long forming effective armour. There are also many scattered white spots all over the upper body surface of the Bowmouth Guitarfish; whereas the Giant Guitarfish has lines of white spots that aren't always visible. Continuing with the larger sized sightings, we ended the month off with a Grey Reef Shark on Aerial Reef. We were nearing the end of the dive when it swam by in front of us. It circled us a few times before darting after a fish and disappearing. This month has also seen the end of turtle season. Luckily most of the hatchlings hatched out before the rough seas washed the beach away. That does not mean the end of turtle sightings on our dives, we still see our regulars - Loggerheads, Greens and Hawksbills going about their business on the reef. The days roll by, hot and without a cloud in the sky. One morning we wake up with promising clouds on the northern border of the desert-scape. Late afternoon the north-eastern wind picks up, different to the western winds usually blowing this time of the day, and thunderclouds roll closer before emptying their life-giving fluid onto the dry waiting land. As the skies clear once again, the smell of fresh ground pricks the senses. Young springbok pronk and chase each other around puddles and in the distance the first call of a black backed jackal can be heard in the coming dusk. Not only does rain mean new life, but also sights of birds rarely seen down here in the desert. Like the graceful Grey Heron and the smaller Cattle Egrets. A Great White Egret has even been spotted by Richard and his guests. 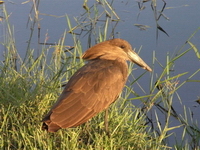 The first Cattle Egret was spotted at Little Kulala on Wednesday 21 March, near the swimming pool. When guests walked out onto the deck, the Egret took flight from the swimming pool. The next day there were two and then on Monday 26 March, as we came out three took flight to a nearby tree, giving us the perfect opportunity to photograph them. 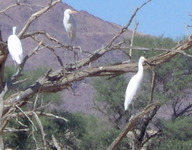 The Egrets were also seen whilst on drives going through the Aub River towards Kulala Desert Lodge. The desert holds small surprises every day, we just need to open our eyes and see?